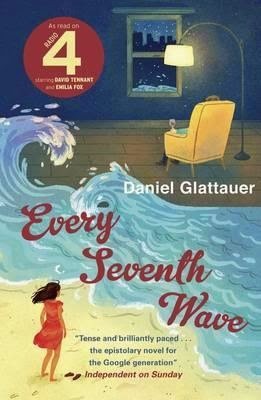 (Every Seventh Wave is a sequel to Love Virtually, so this review contains spoilers for that book which is incidentally very good and which I'd probably give four stars to). I've read an email affair. I have what I believe the kids refer to as "Mad Skillz". I was going to explain more about that but I can't do so in a short way, so just take it from me that I know what a casual email which turns into something more reads like in real life. It's quite a lot like Love Virtually, which is really good. If I had a criticism of the radio play, it was that it felt rushed, which the book does not. I've read it twice, and the second time - with the benefit of Meatworld Knowledge - I was especially struck by how well it's done. It's written as a series of email exchanges beginning when Emmi Rothner, attempting to cancel a magazine subscription, mistypes the email address and sends her increasing frustrated missives to Leo Lieke. They strike up a friendship and the title of the book gives a heads up for where it goes after that. The pacing of Love Virtually is done really well. The characters are well rounded; Emmi in particular is quite unpleasant. She is demanding, self-centred, vain, and spoiled, but, crucially, she is very readable. Then there is the ending: it was perfect. Leo is leaving for Boston and Emmi is supposed to be going round to his flat so they can meet face to face before he goes, just once, only she doesn't and when she writes to Leo to explain why, all she gets is the autoresponder telling her the email address no longer exists. So I was disappointed to find out there was a sequel. Emmi and Leo were not epic star-crossed lovers. One of the nice things about having a book which is purely email exchanges is that it allows the reader to have their own opinion, and mine is that they were selfish, stupid fantasists who got carried away with themselves and needed to think about the people they were hurting. Every Seventh Wave is a sequel for people who were rooting for Emmi and Leo, and by god is it tedious. What was well done in Love Virtually is boring, and repetitive here. There is a glimmer of something better at times, but for much of it there are no outside forces, no real life world forcing itself in. This book begins with Emmi's exchanging messages with Leo's autoresponder, months after he's left for Boston, but what's missing is the hole in Emmi's life which leads her to still sit there sending messages to this guy 9 months after he left. The hole was there in Love Virtually, she could be frivolous Emmi, saying what she thought without worrying about it, but here it feels convenient, and that's a good summation of the book. Stuff happens, but it's not compelling and it's reported by the characters, rather than the more natural exchanges of Love Virtually. Crucially, I don't know what Emmi and Leo see in each other. More than once I found myself wondering why one or the other of them didn't tell the other to take a running jump. I could forgive if it was entertainingly bitchy, or even just human, but it's dull and it's boring, and in the end I just didn't care. In brief, it feels like it was written because the first was such a big success, and that's a shame. If you were the type of person desperate to find out what happened next with Leo and Emmi, you'd probably like it, but otherwise let Love Virtually stand alone. I found the story a great disappointment, so I'm going to give it one and a half stars.